That is a good one. Have a terrific Tuesday. Oh! It's bound to be a HIT!! Heeheehee. Now that's a song we like! Wait, isnt that a doggie thing? And that sure IS one of thier favorite things to do! 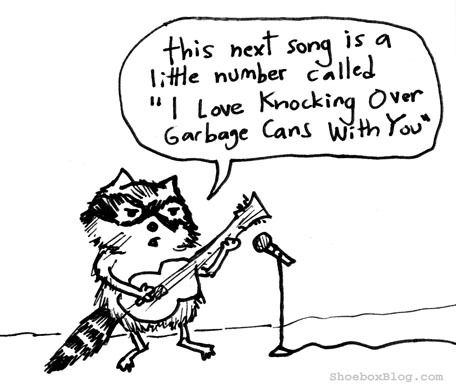 Ahh....nothin' warms the heart like a little romantic raccoon tune! We used to have one of those fellas around here! I love this little cartoon. The raccoons name should be Bandit because of the mask around his eyes. I think the title should be shortened down a bit but it is very accurate. I love this. Infographic: What does your pet say about you? Why do some cats love water? Maxwell Gets Artsy, plus a winner!